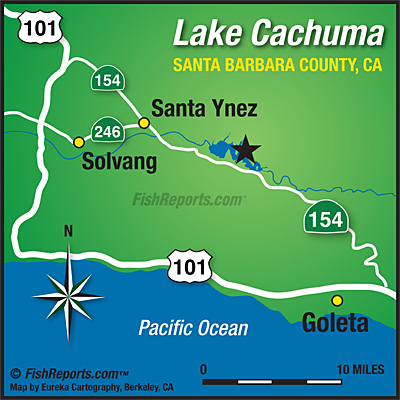 Welcome to beautiful Cachuma Lake. The bite is strong for Rainbow Trout. They are about 30 feet down and are being caught on a Carolina rig with cheese or worms. Patience is key. The crappie are biting The crappie are biting about 10 to 15 feet under the surface of the water. Large and Small mouth bass are biting constant all day long on top water or flicker shad lures. Catfish are caught off the bottom in muddy areas using catfish dough or mackerel for bait. Bluegill and Redear come up on small baits on a floater. Also, they are usually caught while jigging for crappie. We are at about 35% capacity here at the lake with about 90 feet of water at Bradbury Dam. Still plenty of water for great fishing!! As the water level goes down the fish come up! Come visit our bait shop for any tackle and bait you may need. Our friendly and knowledgeable staff will be happy to tell you where the fish are biting and even help you set up your fishing pole and rig! We have live bait for sale as well as coffee and snacks! Check out 805webcam for: weather conditions and scenic views.